Opaline Absinthe is made in Switzerland by the distillery Claude Alain Bugnon, which also produces the Clandestine Absinthes. Unlike normal Clandestine Absinthe which is produced as La Bleue, the Opaline Absinthe is made by a green colour, and this gives a very high complexity, which the other La Bleues do not have from the Val de Travers and appear almost boring. 12 different herbs are used in the Absinthe Opaline to achieve a "round" flavour. Besides large wormwood, fennel and anise, angelica is also used during the distillation. The result is really impressive. An atypical green coloured absinthe from the Val de Travers, whose strength and a noble bitterness shows the Absinthe Opaline`s distinctive character. 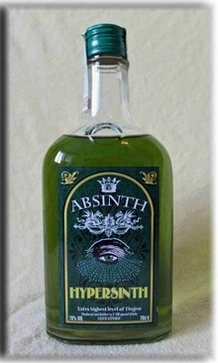 On the label of the Opaline Absinthe is also a gemstone replica applied to note the extrovert exceptionality.